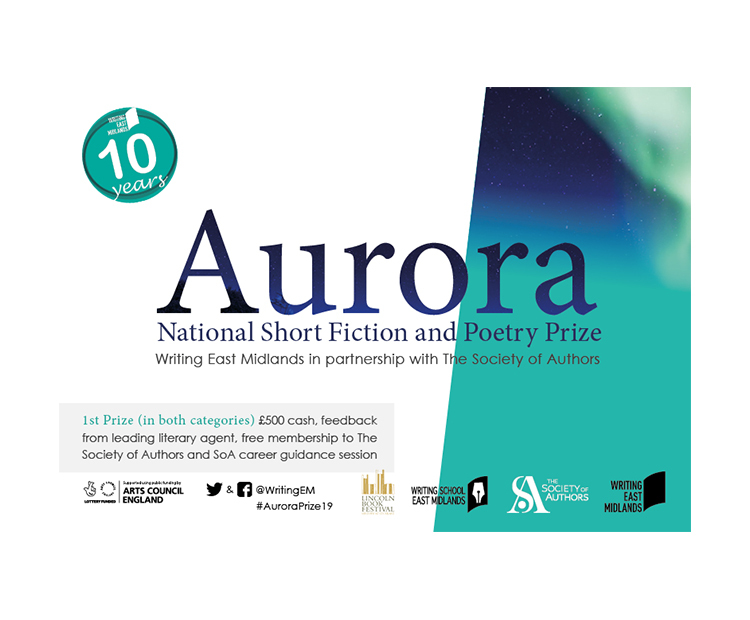 Writing East Midlands is proud to announce that the Aurora Prize for Writing 2019 is open for submissions. This is a national competition for outstanding new writing in short fiction and poetry. The prize was first awarded in 2016 and are excited to be relaunching it in 2019 in partnership with The Society of Authors and Lincoln Book Festival. The judges for the prize are, for Poetry, Malika Booker, Seamus Heaney Centre Prize Nominee and for Short Fiction, Alison Moore, Man Booker Prize Nominee. 1st prize (in each category) £500 and the opportunity to have work critiqued by a matched literary agent. First prize (and regional) winners will also receive a one-year membership to the Society of Authors, which includes access to advice and resources on all aspects of the business of writing. They will also be offered a session with Society of Authors staff including an introduction to how the Society can support them in their careers as professional authors and covering essential advice on copyright, payment terms and contracts. The prize is open for submissions until Wednesday 26th June 2019. Entry costs £9 for first entries, £7 for additional entries and must be made online. Further information, including submission guidelines can be found here.